The McCausland Hospital Auxiliary Kicks Off the Next Fundraising Campaign! 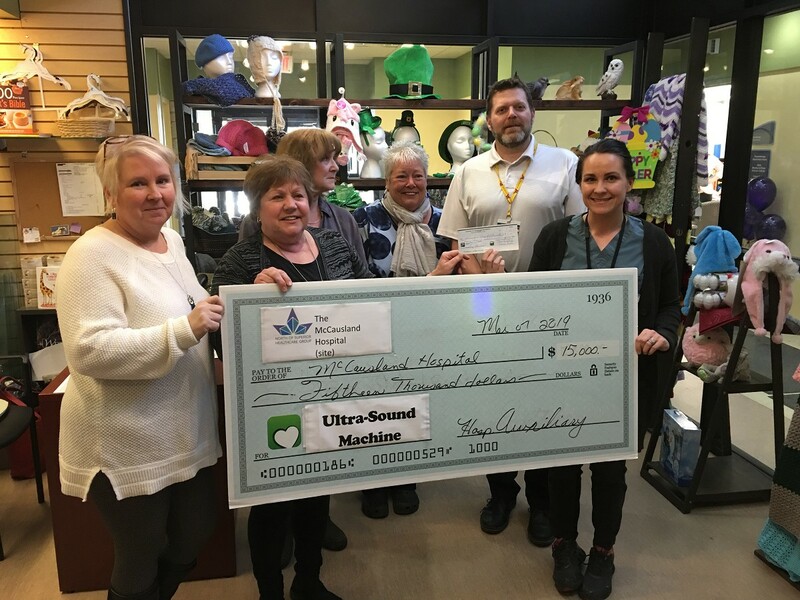 The McCausland Hospital Auxiliary donated $15,000.00 to kick off the next fund raising campaign for a new Ultrasound Machine at the Terrace Bay hospital. Thank you so much for your continued support to The McCausland Hospital. Cash Calendars are printed and for sale! You can buy your Cash Calendar at the reception desk at WMGH, The Gift Shop, Centre Mall, & Beautiful You. In Terrace Bay, The McCausland Hospital reception desk, The Olive House and in Schreiber at Spadoni Home Furniture. We were fortunate again this year to have local businesses sponsor each month. Sponsorship pays for the printing of the Cash Calendar which = 100% profit. Thank you “2019” Sponsors & to all our supporters who bought Calendars! The Perfect Gift! Hospital Cookbook! Cookbooks are for sale and can be purchased at The Gift Shop at WMGH and from Erica at The McCausland Hospital or the Gift Shop. Don’t miss out, some great recipes submitted from staff & volunteers from both hospitals. Ontario Power Generation has donated $15,000.00 to The McCausland Hospital Emergency Department. Thank you OPG, for helping our hospital grow! A very special Thank you to all the Volunteers from Marathon, Terrace Bay & Schreiber who have been taking time out of their day to help sell for Chase the Ace, Christmas Fund Raiser, & Cash Calendars. Your efforts and dedication is all about caring for the growing needs of our community and we could not do it without YOU! Nevada Booth Volunteers are back full swing volunteering their time from 11:00 to 4:30 daily. Volunteers are back at The Gift Shop, which is now open 10:30 to 3:30 daily.